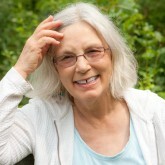 Elaine, I am moved deeply by your beautiful article and the sharing of your waiting journey. You are so right that we should honor and respect waiting, even when it’s hard. 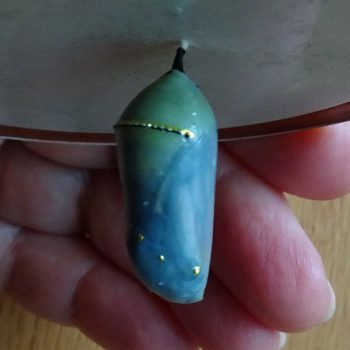 I love your example of the chrysalis. Nature has so much to teach us about waiting, faith, and hope. Thank you for commenting and for contacting me on Twitter, Elizabeth. I’ve fallen in love with Monarch butterflies the last few years, watching the cycle of their life unfold and being part of the miraculous transformation. Somehow it’s never boring to watch caterpillars chomp on milkweed leaves. Sometimes waiting is the only choice in life, so it’s good to know that within that limitation we can choose to become quiet and in touch with the heart or we can go with impatient and frustration. For me, it’s a constant meditation practice to take the calm path. Dear Elaine, thank you for your beautiful words. I spend my life waiting. Right now I am waiting for a carer to come and help me. Being ill for so many years and needing carers has taught me a level of patience that I never thought possible in this lifetime! It has also taught me to notice the really small things around me and keep a sense of wonder and thankfulness. Reading your words today has given me a wonderful sense of peace. You know more about waiting than I can imagine. When my husband was a cancer patient, I learned what it meant to be a patient, to care for a patient, the patience required in waiting rooms or waiting for help to arrive, in chemotherapy rooms or while waiting for another test result or a stem cell transplant. The only way I could get through a challenge such as yours would be to find those moments of wonder, thankfulness, kindness, beauty, and love in the midst of the difficulty.. In the grocery store today, I spoke with an old friend with a difficult symptoms about the need to keep searching for joy. Your words complete the circle by returning peace to me. Thank you for your kindness. dear Elaine . . . Thank you, Sparrow. It seems I’m always asked to stretch beyond what’s comfortable for me. By nature, I tend toward impatience and hurry. The beauty of the seasons and a few inspired teachers teach me so much about approaching our world and challenges with peace and tolerance. Wishing you well in all ways. Dear Elaine, thank you. I have taken quiet inspiration from this beautiful written meditation on ‘waiting’ as well as from your other essays offered here and on your website. The Monarch butterfly became something of a spirit guide for me about 5 years ago. So I should not have been surprised (but was) to find myself sheltering two Monarch caterpillars in need of help this summer. 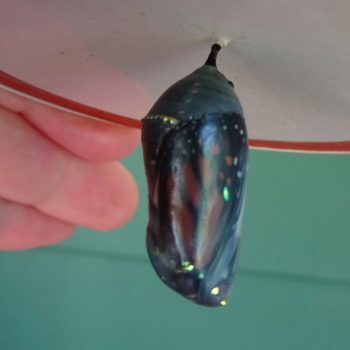 Raising them in jars on my back porch became for me an exercise in practicing equanimity (especially when only one of the caterpillars formed a viable chrysalis): to do what one can with great love and then to let go of attachment to the result. It was a joy to release my one little Monarch on September 21st. I like to imagine she is now roosting among her ‘tribe’ in the sacred fir forests of Mexico. Namaste. I also hope your little one made it to Mexico and my little tribe. 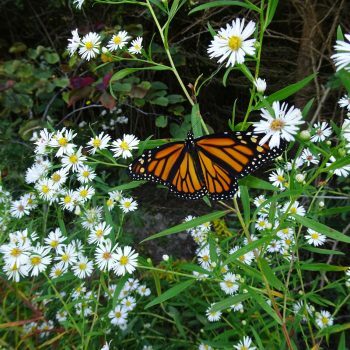 I saw a Monarch on my trail here on Nov. 2. The thrill of beauty and color and joy rising out of the browned fields followed by the stab of acceptance that this one hatched too late in the field or was traveling south too late and doesn’t have a chance. There were no flowers for nectar and the wind was from the wrong direction. I couldn’t save it, but I could honor its beauty and accept. Monarchs = Joy for me. I like thinking of equanimity, too. We tend them and then surrender to what destiny has in store. Another reminder that our egos are not in charge. Thanks for reading my pieces here and on my website. Thanks for tending the butterfly world wherever you are.. Blessings. I had just spent at least half an hour waiting to tell my telephone company that my land line was out of order. Simple? Not a bit of it. I was eventually connected with a technical department where the woman who took my call spoke with an American accent and some of her queries convinced me she wasn’t in New Zealand or anywhere near it. “Where are you?’ I asked. ‘The Philippines.’ Not at all surprising; just totally amazing that the repair of a phone in Auckland is organised by a woman in the Philippines. We made friends then and there, we made a connection. That’s what comes of waiting, Elaine. I went to the Gratefulness website, and found your blog and read of the depths/heights waiting can take us to. My day, quite ordinary, has become inspired. Thank you. We live in an international world, don’t we? You are in New Zealand. Your phone was dealt with by someone in the Philippines, and you’re interacting with me on line in the United States. I do not like those long waits, but it seems we can’t escape them now. A time to give thanks, a time to pray, or often a time to fume a little about modern life. I hope your phone works again. Beautifully written 🙂 Timely for us. It’s certainly one thing to awaken to the objective reality of our True Self. Another thing to subjectively dwell and live out of that reality moment by moment. The older I get the more you see the almost comprehensive role of waiting in goodness, truth and beauty incarnating and flowing in, through and as us. Yes, the piece is more timely than I knew it would be. I love the way you’ve expressed the connections between waiting and many other virtues. Of course, any meditation or prayer practice involves a sense of waiting. Dear Elaine, thank-you for your sharing, it is such a beautiful reflection! A sense of peace came over me after reading it and I needed that today. Thank-you from my heart. Bless you, dear Elaine. Thank-you, Elaine. Thank goodness for small kingdoms. Yes, we are fortunate if we can nourish hope and gratitude in small spaces so we have strength to face the larger world. Thank you, Miguelie. Slowing down has become like an elixir for me. Thank you, Allyson. That’s the question, isn’t it? Waiting is part of living. We can make our pause a mindful meditation or we can spend our time pumping up negativity and impatience. I try to remember I have a choice every minute. Korakas, you must have those qualities growing within you wouldn’t know to watch for them. That self-awareness seems like the essential step. Thank you for your kind encouraging words and blessings. May we all be blessed.